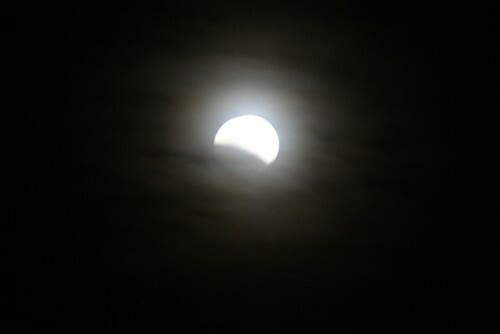 Lunar eclipse viewed from Patzcuaro Mexico . The word Mexico comes from the Nauhuatl, the language of the Aztecs. It means "The center of the moon". Another interpretation is el ombligo de la luna (the navel of the moon). Long, long ago the Aztecs traveled in search of a new home. They looked for a sign that would tell them to stop moving and build a new city. In a broad valley filled with lakes they saw the sign: an eagle standing on a cactus, fighting a serpent. This image is now depicted on the Mexican flag. This country is magical and very, very special to me. One day,when you are older, I hope I can share it with you and your parents through the Monarch Teacher Network. My connection to this project has brought so much joy and inspiration to my life as a teacher and an individual. This is a journey I am so grateful to be on! And I am thrilled to be able to share even a small part of it with all of you!